Sgt. 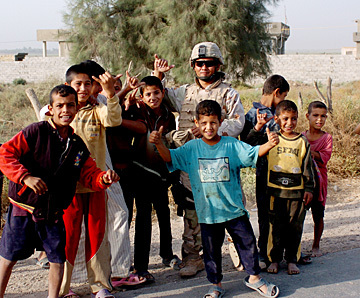 Wilgene Lieto, shown here flashing a shaka with Iraqi children in the village of Albu Hishma, was killed Monday when his Humvee hit a homemade bomb. Homemade bombs killed three soldiers with Hawaii's 100th Battalion in the past week. And they injured several soldiers from the unit as well, with one soldier losing both legs. The bombs also destroyed as many as five Humvees in what has been a particularly lethal month for the 100th Battalion and American troops in Iraq. These attacks turned October into the deadliest month for U.S. troops this year, the Associated Press reported this week. The U.S. command reported Monday that seven more U.S. service members, including two belonging to Hawaii's 29th Brigade Combat Team, had been killed by "improvised explosive devices." More soldiers and Marines are dying from the bombs than from small-arms fire or mortars. The three soldiers with the 100th Battalion killed by homemade bombs were not from the islands. Their deaths were "heartfelt losses," said Maj. Mike Peeters, executive officer of the 100th Battalion, 442nd Infantry. "It's liking losing a part of your family. It was a sad day for our battalion and a sad day for the people of Hawaii." Peeters said the homemade bombs have caused a lot of trouble for U.S. troops. "We have lost four to five Humvees where the entire engine was blown off, or the back of the vehicle was totally destroyed," he said of some of the vehicles used by his 100th Battalion troops. "But miraculously no one was injured." The 100th Battalion has already been awarded more than 48 Purple Heart medals since it arrived in Iraq in February. Two members of Peeters' unit were killed Monday when their Humvee hit a homemade bomb. The Army identified the soldiers as Sgt. Wilgene T. Lieto, 28, and Spc. Derence W. Jack. Both lived in Saipan. A memorial service for them will be held at their post in Iraq on Nov. 5. Since arriving in Iraq, the 29th Brigade Combat Team has suffered 16 combat deaths -- almost all of them victims of homemade bombs. Ten were soldiers from an affiliated California unit, three were members of the 100th Battalion, and one was an Army reservist from Washington. Only Sgt. Deyson Cariaga, who was with the 29th Brigade's intelligence company, is from the islands. Peeters also spoke about Sgt. Evan S. Parker, 25, who died on Oct. 26 at a U.S. Army hospital in Germany after sustaining injuries from a homemade bomb in Iraq. The Arkansas, Kan., resident was injured when his patrol was attacked in Balad on Oct. 23. Although Parker was a member of the 29th Brigade Combat Team's 1st Battalion, 487th Field Artillery Regiment, he had been assigned since February to the 100th Battalion, Peeters said. "I knew Sgt. Parker," Peeters said. "In fact, I know every soldier in my battalion. Each one has made an impact. But we will pick ourselves up and continue the march." The Saipan Tribune yesterday reported that Jack and Lieto were expected home in four months. Jack worked as a Cash Department manager for Bank of Guam, the newspaper said. He was married and had just celebrated his fifth wedding anniversary on Sunday. The couple has a 4-year-old daughter. Lieto, a police officer from Tanapag, was married, with a 4-year-old son and a 3-year-old daughter. The Pentagon yesterday identified two California soldiers who were killed in Iraq last weekend and members of an infantry unit assigned to Hawaii's 29th Brigade Combat Team. Killed on Oct. 29 near Baghdad when a homemade bomb exploded near their Humvee were Capt. Raymond D. Hill II, 39, of Turlock, Calif., and Sgt. Shaker T. Guy, 23, of Pomona, Calif. Both soldiers were assigned to the 1st Battalion, 184th Infantry Regiment, from Modesto, Calif., which is one of three units assigned to the Hawaii brigade. Of the 16 combat deaths experienced by the 29th Brigade since the unit arrived in Iraq in February, 10 were soldiers from the California unit. Two days earlier, Lt. Col. William W. Wood, who assumed command of the 1st Battalion, 184th Infantry, several months ago, was killed by a homemade bomb in Baghdad. Wood, 44, was promoted to colonel posthumously, making him the highest-ranking officer to die in Iraq. Wood, of Panama City, Fla., died while directing security operations in response to the detonation of a bomb that killed Capt. Michael MacKinnon, a 1997 graduate of the Military Academy. During this response, a second homemade bomb detonated nearby, killing Wood. MacKinnon was nine months into his second combat tour in Iraq, the Billings (Mont.) Gazette reported last weekend. He was assigned to the 3rd Infantry Division at Fort Stewart, Ga., but after problems cropped up with the California infantry unit and several of its leaders were relieved, he was picked to command Alpha Company of the 1st Battalion, 184th Infantry. MacKinnon's older sister, Laura Sullivan, told the Montana newspaper: "This is a horrible thing. It kills me. He was one of the most lively people I ever knew. For my father it's devastating. He was just an amazing person. "There's nobody here that has any rage or anger," Sullivan said. "When he came home, he'd talk about the war -- he believed in what he was doing. He felt he was making a difference. He said he belonged there and that they were all making a difference." Brother-in-law Michael Sullivan said, "He was a very accomplished young man -- a valedictorian, an Army Ranger, a captain on the fast track who was serving his second tour. He was the ring-bearer in our wedding." "He was an exceptional soldier," Laura Sullivan added. "He was 100 percent American, apple pie and Chevrolet. What more can you say?"